It is December 18th, 1920. Imagine sitting in a well-worn armchair next to a wood-burning stove, snow just beginning to fall outside the window. On your lap is a Saturday Evening Post, America’s most influential and beloved magazine. You spent a nickel to secure your copy. First, you admire the fine artwork by Ruth Eastman - a woman donning a red hat made of feathers, looking down at her watch, ice skates tucked under her left arm. Yes, the Norman Rockwell illustration of the boy pushing the baby carriage while being teased by two other boys in red and white baseball caps was your favorite, but the reds in her hat and on her cheeks and the grace of her fingers and gaze were admirable. Instead of lifting the cover to view the table of contents, your thumb slips into the center pages of the magazine, igniting your imagination with the potential for a short story by F. Scott Fitzgerald. You had loved Bernice Bobs Her Hair in the May issue of the magazine. After all, it was about a girl from Eau Claire, Wisconsin, who sneaks into her cousin Marjorie’s room and cuts off her pigtails, throwing them onto the porch of a boy. You were also hoping for an article on prohibition, a new serial, or more pictures of the Essex automobile, an affordably priced enclosed passenger car you were hoping to soon own. "Because keeping the body clean inside will prevent much of the sickness in every home..."
"Protects the health of all the family from Baby to Baby’s grandparents..."
"Known from one end of the country to the other for the splendid satisfaction it gives its users..."
turn the page, eagerly beginning Lizard by Rita Weiman. 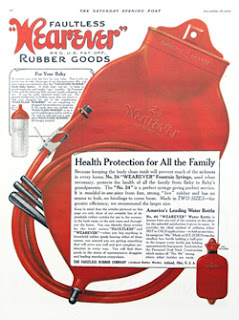 Wasn't it interesting that home enemas were so accepted 90 years that an ad like this got open display ago in probably the most popular magazine of its time. An enema bag thus could be stored on the back of a bathroom door for all to see without "shame." My mom preferred a hospital-type enema can, but let the tubing drip-dry openly after use to join the can on a closet shelf. Dave. Today people are obsessive in hand washing, while neglecting a similar idea in an area where all will agree, that cleansing should only make common sense, then. I dont know about enemas in the 1920's because I was born in 1934. The best enema I ever took was with the 60 inch colon tube I purchased from you a few weeks ago. I expect to purchase additional enema equipment it the very near future.